Disney Rewards! Look What I got! Here's another fun rewards program that takes little effort. I started collecting points awhile ago for the Disney Movie Rewards Program and I'm just now cashing in. I got a Winnie the Pooh movie for FREE! I also just submitted for a Handy Manny DVD that I will also get for FREE. Once you sign up for a FREE account with Disney Movie Rewards you enter in codes found in DVD's and CD's. When I first joined I went through my Mom's collection and found some codes just wasting away. :) You can also get points for Disney Movies you see at the theater. Random Magic Codes will also be available from time to time. It really does add up! --if you want me to start posting when codes are available let me know in the comments, and I will. 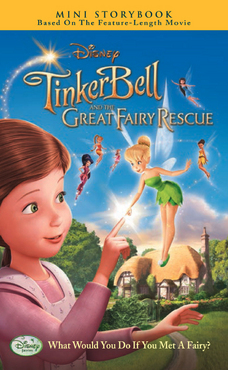 Also right now you can download for FREE: "Tinker Bell And The Great Fairy Rescue" Mini Storybook. Look under the Rewards tab. I downloaded it...very cute. Oh yes...I am always looking for these great codes! I'd love it if you would! Yay! I signed up! :) I already have 55 points! I would LOVE for new codes to be posted. I would also love for you to post codes!